Soccer Ball History goes back to 1855. Early Years of the Soccer Ball History originate from United States of America and year 1855. Charles Goodyear was the first person to make a soccer ball in 1855, using the same concept that is still practiced today in making soccer balls. Charles had invented vulcanized rubber back in 1837, however, the first soccer ball made out of the vulcanized rubber was years later in 1855. Before the invention of vulcanized rubber and the soccer ball, history of soccer shows people kicking all kinds of things on the ground instead of the soccer ball. During the middle ages people used pigs bladders and human heads as a way to entertain themselves kicking it on the ground with no real purpose like scoring goals. It has been nearly 150 years since the first Laws of the Game were written and the first soccer ball made. Charles Goodyear was the man who invented the first soccer ball, and it was made here in America, back in 1855. 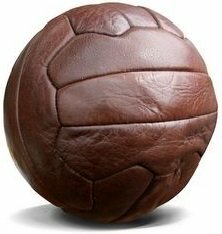 Only a decade later, in 1865, Charles Goodyear soccer balls became the official match balls in the first organized soccer leagues in England. Technology over the past 20 years has advanced and evolved every part of the soccer game, including soccer balls, uniforms, stadiums, cleats, fans and every other part of the game. Today, every league and competition has its own design for the soccer ball that is used for different competitions. World Cup balls are customized for each tournament every 4 years, and all other Major Championships also have their own design and logos for the ball used in the game. Today's technology seems to be writing the history of the soccer balls for the future. Scientists are changing the way this game is played by developing soccer balls with different characteristics to make the game more exciting and fast paced, leading to more goals scored during games. Soccer balls we see today are made with the intent to make them swerve more than usual, making the game more exciting with more goals being scored. With the way technology is going, the soccer ball history is taking a sharp curve from the normal balls used in the 1990s. Goals make this game exciting, and technology helps provide that. For more detailed history about soccer balls visit The History of the Soccer Ball.